Creamy, rich, delicious – and filling. 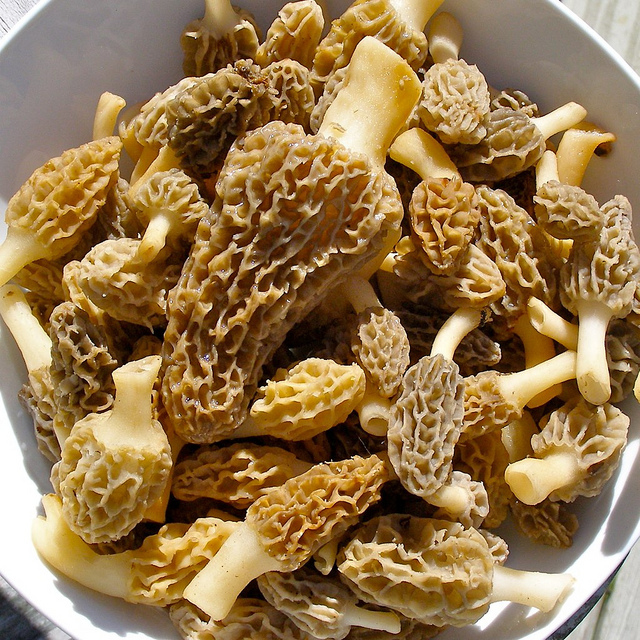 Mushrooms are very common in the Northeast, and are starting to spring up everywhere. 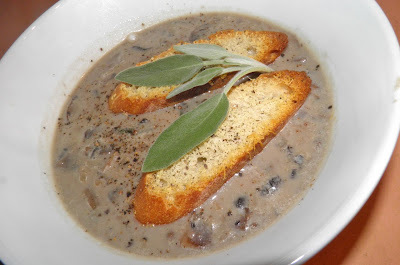 Since the season is soon upon us, one needs a mushroom soup recipe. Don't you agree? This is the best mushroom soup I have tasted in a very long time. What makes it even better is this recipe is mine. No help or hints whatsoever from any sources. I am indeed proud. The trick about mushroom soup is getting lots of flavour and body into the finished product. There’s nothing worse than a few pieces of mushroom floating in what could pass for skim milk…. And it is a trick to make those two happen. Compare this to a can of the jelly called mushroom soup, if you even can. There are a few “learnings” I applied to this recipe to achieve those goals. The first – and probably most important is frying the sage. Fried sage is an under-utilized culinary treasure. A quick and simple way to experience it is to fry sage in butter until nearly crisp and then toss with plain pasta. Try it. It’s fattening, but you’ll fall in love. The second was to thicken the soup using grated fresh bread. This is an extremely old method of thickening broths and soups. It certainly goes back to medieval times and probably much further. I also included a potato (diced very small) just to close the deal on the soup body factor. The small potato pieces nearly cook away during the 15 minute simmer. Remember this is mushroom soup, so your choice of mushrooms is important. Some people will only eat white mushrooms, and this can be made admirably well with just those. 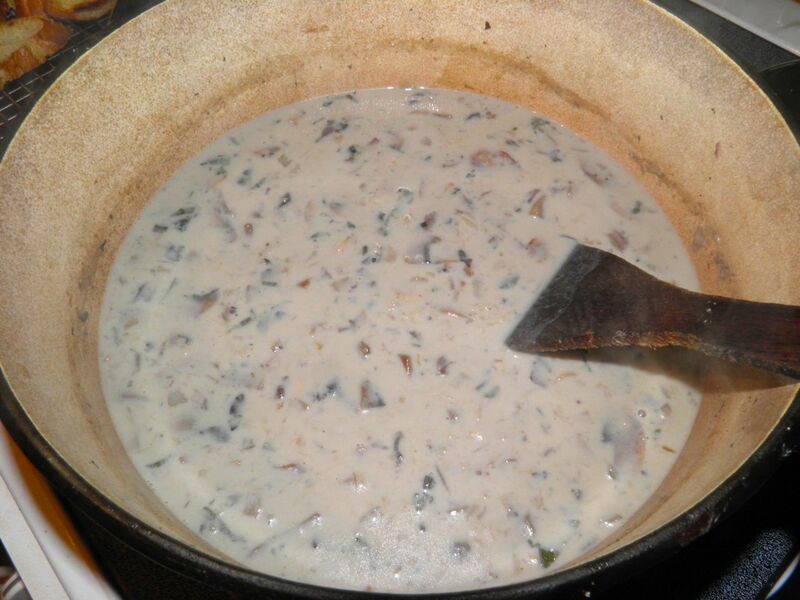 But crimini, portobello or a mixture of all three will add more complexity to your soup. There are folks at farmers markets that sell foraged and/or fresh specialty mushrooms. It’s always good to keep an eye out for what’s available. I probably wouldn’t try dried mushrooms – at least not entirely. Good mushroom soup needs the springiness of fresh mushrooms. If you try this I can almost guarantee you will never buy canned mushroom soup again. Melt the butter in a large pot. Add the onion and garlic and sauté for about 4 minutes until slightly browned. Slice the mushrooms while the onions cook. Add the sage to the pot and fry for about 1 minute. Splash a little vermouth into the pot to deglaze the bottom. Add the mushrooms and sprinkle with a little salt. This will help draw the moisture out. 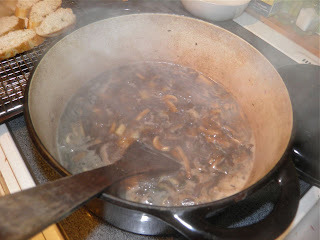 Sauté the mushrooms for 5 minutes until softened. Add the potato, pepper and water, and some more salt, and bring to a boil. Let the potatoes and mushrooms simmer for 15 minutes. After they have cooked, sprinkle the bread crumbs over the top and stir into the soup. Then add the milk.. If serving 6 people, use 2 cups. If serving 8, use 3 cups. While the potato and mushrooms are boiling, slice the French bread and sprinkle with parmesan cheese. Put on a wire rack in a 400°F oven to brown until the soup is finished. Check to ensure they don’t burn. 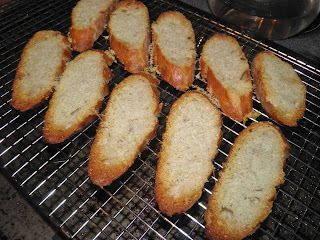 To serve, ladle the soup into individual bowls and top with two slices of browned parmesan bread. Sprinkle with a little more pepper and decorate with a fresh sage leaf. * You can use any selection of mushrooms. The weight is what’s important.